During second nine weeks, all seventh grade students are required to complete a research project assessing CCRS. 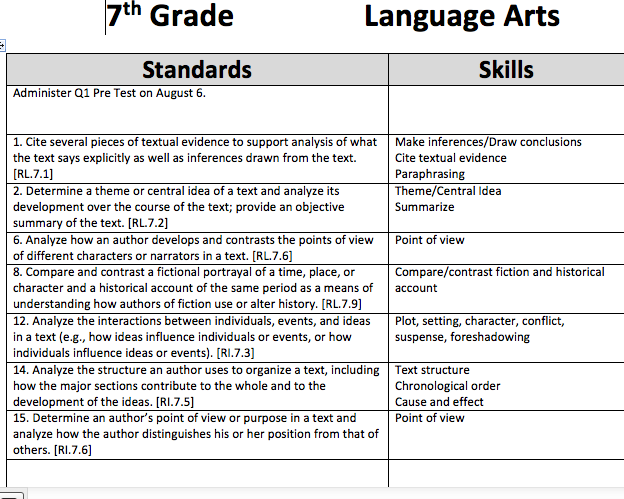 All seventh graders just turned in a budget project for Mr. Carlisle's class, so my ELA classes will adhere as closely as possible to standard W7.7 which calls for students to conduct SHORT research projects. Students will complete a short research project to answer the question, why is this a holiday? This project will require students to conduct research on an assigned topic and summarize that information using their own words. The "Why is this a holiday?" research packet was sent home with students and attached to our Remind text yesterday. You can click on the links to download a copy of the Parent Information Letter and "Why is this a holiday" Research Assignment. This assignment is due on December 16, 2014. Late assignments will not be accepted without an excused absence. 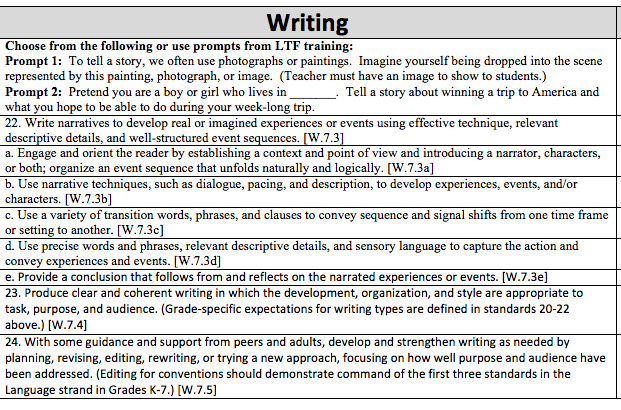 Writer's Workshop lessons on Fridays will focus on teaching skills necessary to complete the research; however, most of the actual research will need to be completed outside of school. Please email me if you have any questions. All ELA classes attended Library Orientation with Ms. Stewart on August 25, 2014. Ms. Stewart passed out Mature Content permission forms to students interested in checking out books in our library that are classified as mature content. The Hunger Games, Catching Fire, Mockingjay, Twilight, New Moon, Eclipse, Breaking Dawn, Vampire Academy, and Divergent are some of the popular Young Adult fiction that will require a signed MC form on file with Ms. Stewart before these books may be checked out in our library. All students know their ZPD (Reading Range) and their point goal. This year, my classes are required to complete a Book Review on an AR book in their Reading Range each nine weeks. A parent letter and the choice list was sent home with students on August 27th. After twelve days of school, I believe most every seventh grader has completed their Quarter 1 Pre-test and STAR Reading test! It served to be quite a challenge due to internet issues, activities, and absences. We are working on our second week of Daily Grammar Practice (DGP) and ELA Daily Reading Practice. There are still some students that need a five subject spiral notebook for our Interactive Journal. We work in the journals daily. To save precious instruction time, journal construction is being assigned for homework. By assigning the coloring, cutting, and gluing for homework, we can utilize class time to complete the journal entries and interact meaningfully with text. I can not stress enough how important the journal will prove to be to each student as the year progresses! For the first few weeks of school, students will be learning how we do things in the classroom. We do DGP and ELA together. They are reminded daily which section to put assignments in their journals. Attention is called to the Homework Area, Coming Soon section of the board, and the Check It Out board for missed work. Once students understand how the classroom runs, we will begin moving much faster in the classroom. We are working on Parts of Speech, Sentence types, and Conflict this week in class. We are reading the short story, "Thank You, M'am," by Langston Hughes. Students will have a story quiz on Thursday and a Parts of Speech daily grade on Friday. Friday is set aside for Writer's Workshop. We are currently working on Reflective Writing. This week, we will begin elaborating on "One lesson I learned the hard way..." Students will begin writing in the narrative mode using this reflective prompt. So far, no one has moaned or spit nails when writing folders have been passed out in class. I take that as a win! Please bear with me as I get this blogging thing down! I'm still a novice when it comes to blogging. It can be rather daunting to begin a new blog. I'm still trying to figure out how to post PowerPoints and notes in a doc format. My YouTube channel has the Parts of Speech rap we used loaded under play lists. I'm definitely in a learning curve when it comes to the blog, but I truly want to keep parents up to speed with what is going on in class. While I figure everything out, I am attaching notes and directions via Remind, so please sign up for that service if you haven't already done so.